The Means: I own a pie plate and my fridge is perpetually stocked with Greek yogurt. 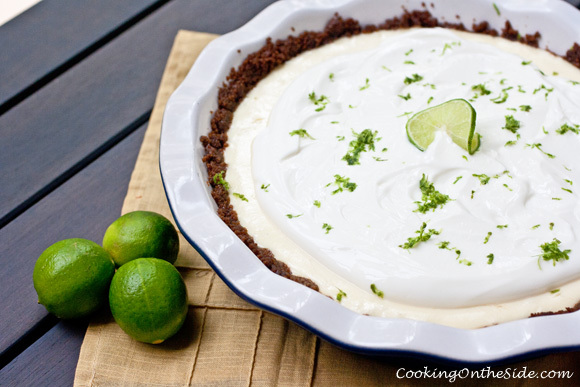 The Motive: I’ve been wanting to post a Key Lime Pie recipe on this blog forever and finally found a terrific on-the-side recipe from Chobani. The Opportunity: It’s Pie Day! I am guilty of pie! Honestly, it doesn’t take a lot to convince me to make pie. But in this particular case the stars did align in such a way that making this particular Key Lime Greek Yogurt Pie at this point in time just seemed like the perfect thing to do. 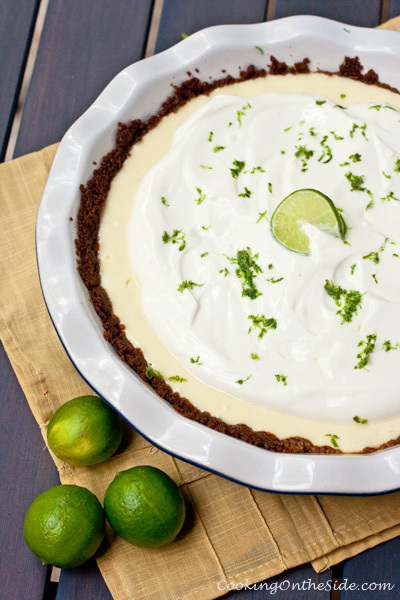 If you love the mouthwatering tartness of a traditional Key Lime Pie like I do, you’ll find the addition of yogurt here to be especially refreshing. Yogurt is mixed into the key lime custard itself and it’s also used for the topping, sweetened with a little confectioner’s sugar (a healthier alternative to whipped cream!). One important thing to keep in mind when using yogurt as a topping, however, is that it does tend to separate after a while. So if you’re planning to serve just a few slices at a time, it’s best to dollop your slices individually rather than the pie as a whole. Take three guesses as to how I know this! So, as I mentioned, today is Pie Day (not to be confused with the Pi(e) Day on 3.14 we previously celebrated with another terrific Greek yogurt pie). Nearly 200 food bloggers will be posting pies today for no other reason than we like pie. It’s as good a reason as any, right? From the Key Lime Pie recipe on a Chobani Greek Yogurt recipe card. 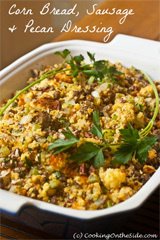 Recipe by Chobani fan Lauri Watson. Preheat oven to 325°F. Whisk together condensed milk, 1 cup yogurt, lime juice and eggs. Pour into pie shell and bake 25 minutes (or until the custard is set with the center still slightly jiggly). Chill pie for 2 hours before serving. When ready to serve, whisk together remaining cup of yogurt and confectioner’s sugar. Spread on top of pie with a spatula. Garnish with lime zest, slice and serve. NOTE: If you’re not planning to serve the entire pie at once, it’s best to top each slice individually with the sweetened yogurt rather than the entire pie, as the yogurt topping tends to separate over time. Chobani was kind enough to include me in a dinner event they held for food bloggers in Seattle recently. Ooooh love that you made the pie with greek yogurt, Kathy!! JulieD´s last blog post ..Cheesesteaks! I make key lime bars that are similar without the yogurt. I finish by topping with toasted coconut, which might be good on this pie. I’ll try it and let you know. Ooooo, my favorite pie now ith a gingersnap crust! Pinch me I’ve gone to heaven. Made this over the weekend and it was incredible!!! Tastes like key lime cheesecake! Super tangy and somewhat healthy. Thanks for the great recipe! That’s so great to hear, Sara!! Just found your recipe. I love ginger snaps instead of graham crackers in a pie crust, but I’m wondering about amount of Key Lime juice…1 whole cup??? Don’t get me wrong, I LOVE Key Lime juice, but every other recipe I’ve looked at has a maximum of 1/2 cup Key Lime juice. Just checking to be sure there wasn’t a typo on that. Looking forward to making this pie sometime this week. 1. When I tried to press the crust into my 9 ” pie pan, there simply wasn’t enough to spread in the bottom and up the sides. I ended up doubling the amount of gingersnap crumbs and used a total of 5 tbsp of butter. That ended up making about a 1/4″ crust on the bottom and on the sides. Perfect! 2. I also added half of the lime zest to the pie filling. Speaking of the filling…the recipe made WAY more than would fit in the pie pan! In addition to the pie, I had enough to fill 2 small ramekins. Went ahead and baked them with the pie and will have some “key lime custard” when we finish the pie. 3. The yogurt/powdered sugar topping needed a little something else, in my opinion, so I added 1/4 tsp of vanilla and a little more lime zest. Will definitely make this again (with my revisions). Thanks! I made this pie a couple of weeks ago. Divine. Making it again tonight for my parents. 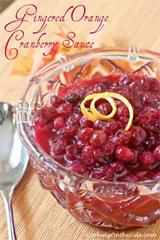 It is a great recipe, thanks for sharing it! Delish! Well be making this again. Mmmm! 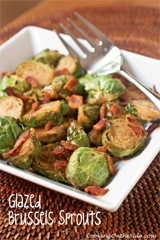 Me and my hsuband (and even baby) absolutely love this recipe – it’s not as fattening as cheesecake but it exactly tastes like it – even better because you don’t feel like it clogs your arteries afterwards, lol. Thanks for sharing! The only thing I’d change next time is to use more crackers and thicken the crust a little bit (just for my taste). Previous post: Bacon-Topped Deviled Eggs + Land O Lakes Giveaway!